When you are walking in the Basque Country, don’t miss the 8 km-long coastal stretch between the towns of Deba and Zumaia in the province of Gipuzkoa. Zumaia is visited in my Sunflower guide, Basque Country car tours and walks (part of the Landscapes Series). The coast here reveals some extraordinary rock formations that are now protected as part of the Basque Coast Geopark, just 30 minutes by car from Donostia-San Sebastián and a little under an hour from Bilbao. The most striking formations are made of what is known as the flysch – a sequence of sedimentary rocks that make up one of the longest continuous rock strata in the world, formed nearly 100 million years ago by the crashing of waves against the cliffs and creating a platform of alternate hard layers of limestone and sandstone, and soft layers of clay and loam. The effect, especially at low tide, is stunning. Park in the bustling, attractive fishing port of Zumaia (Car tour 1 in Basque Country car tours and walks), then start walking from the chapel of San Telmo on the western side of town, perched precariously right on the clifftops above the beach of Itzurun. From the chapel some of the best parts of the flysch can be seen by following the GR121 (red and white waymarking, part of the vuelta de Gipuzkoa route) just 10 to 15 minutes in the direction of Deba. However, it is worth continuing along the same coastal footpath for about an hour to the most spectacular section of coast around Sakoneta, which forms Europe’s most extensive abrasion platform, that can be defined as a sloping or nearly flat bedrock surface that extends out from a sea cliff under shallow water. At low tide, the Sakoneta coastal area reveals a huge variety of wildlife such as cucumbers, starfish and sea slugs, along with many varieties of sea anemone. The platform has been carved over millions of years by the sea to create wavy, almost wafer-like sheets of bedrock of great beauty. Until recently this area was hardly known outside the province but with the creation of the geopark, this is likely to change and so now is the perfect time to explore it. 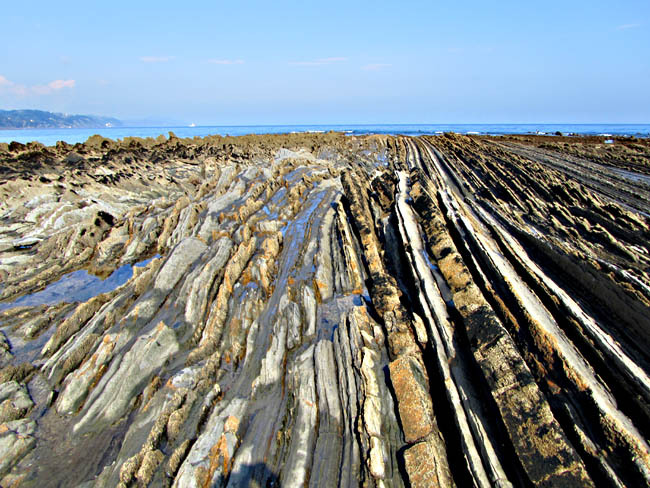 The Algorri Interpretation Centre in Zumaia is a good place to learn more about the flysch, and where guided walks to the most spectacular sections of the coast around Sakoneta and beyond can also be arranged. A new feature here are the 3-hour boat trips from Zumaia along the coast westwards via Deba to Mutriku, which enables the best of the entire geopark to be viewed from the sea. These trips are highly recommended and can be booked before either via the geopark website itself or through one of the local tourist offices in any of the three towns mentioned above. And of course this being the Basque Country, you are never far from mouth-watering pintxos (the Basque version of the tapa) at bars in all the towns and villages along the coast, washed down by the local txakoli white wine – to help recharge the batteries after an exploration of the flysch route! This entry was posted in Basque Country, France. Bookmark the permalink.